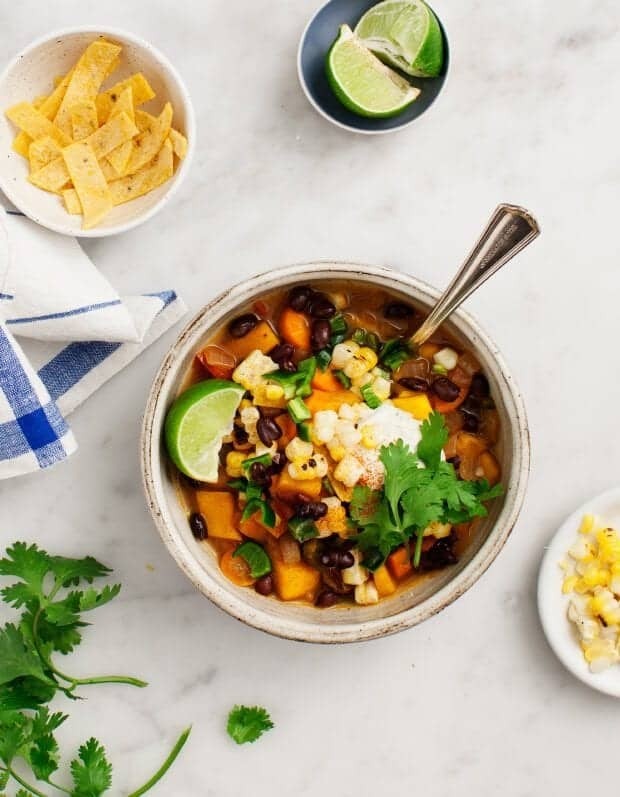 In this butternut squash chili, smoky chipotles & spicy poblanos play perfectly against the sweet squash. It's quick, easy, and so darn good. Are you as excited as I am that it’s soup season? Soups, stews, chili – whatever you call it – I love making a big batch on Sunday and eating it for lunch all week. This butternut squash chili is hearty and healthy, warming and slightly spicy. It’s also one of those soups that gets a little better every day, so unlike most leftovers, I loved eating this chili for lunch just about every afternoon last week. When I made this chili, I had 3 tiny butternut squashes on hand, but you won’t need 3 to make it. Just cube up enough squash to equal about two cups. Along with the butternut squash, I used poblanos in this recipe. Poblano peppers are usually mild, but just a heads up – if you are in Austin and using these little guys from JBG – they’re quite spicy. I used a little apple cider vinegar in this butternut squash chili because I love the bright balanced flavor it adds, but it also helps tone down the spice if you overdo it. I topped my bowls of butternut squash chili with leftover cashew poblano cream, crispy tortilla strips, and cilantro. Feel free to top yours with whatever you like – cheese or diced avocado would also be delicious. Heat the oil in a large pot over medium heat. Add the onion and a pinch of salt and pepper and cook until soft, 5 to 8 minutes. Stir in the garlic, carrots, poblano, butternut squash, and another pinch of salt and pepper. Cook until the vegetables just start to become tender and the onion is lightly browned, about 15 minutes. Reduce the heat if necessary. Add the chili powder, chipotle powder, and tomatoes and cook for 1 minute. 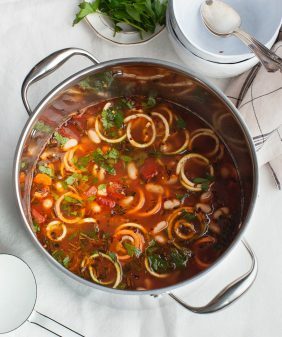 Stir in the apple cider vinegar and black beans and then add 2 cups of vegetable broth (or enough to cover everything). Simmer until the butternut squash and carrots are tender, 20 to 30 minutes, adding more broth as needed. Add a big squeeze of lime. Season to taste with more salt, pepper, and spices to your liking. If your chili is too spicy, stir in a small splash of apple cider vinegar. If it's too thick, add another cup of broth. Serve with grilled corn, cilantro, tortilla strips, lime slices, and poblano cashew cream. *if you're sensitive to spice, start with less, you can always add more. If your chili is too spicy in the end, add more lime juice and/or splashes of apple cider vinegar to tone it down. I am totally with you on this soup season excitement!! And a chili like this sounds great! Yum. For the people asking about using a crockpot (my preferable cooker, as I have two kids under two), this is what I did. It made so much that I made half of it into soup using my immersion blender, and I served the other half over pasta. And I froze half of those halves, if that makes sense. Win, win, win, win! 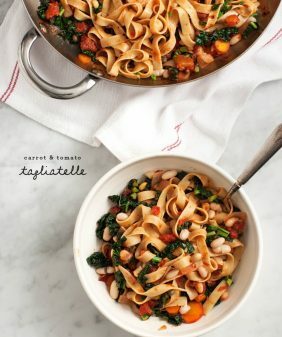 My husband said this was one of the best things I’ve ever made – the soup AND the pasta dish! Awesome recipe, slightly tweaked for the current chaotic state of my life. ? In crock pot, add vegetable broth, both cans of beans, carrots, tomatoes, chipotle chile powder and bay leaf. Add sautéed onions, butternut squash and garlic to crock pot. Cook for 6 hours (or 4 on high). Use immersion blender to make soup out half of the crock pot mixture. After blending, add 1/2 cup (more or less, depending on how much you blend) of heavy cream, let simmer for 5-10 minutes. Serve with sour cream and cilantro. Serve other half (unblended) over pasta for veggie pasta. Side note: to serve to my kids, too, I didn’t add the pepper. That means I also didn’t add the apple cider. Still turned out amazing. Delicious. I ended up adding a bit more of this and that as my supplies required, but the flavor combinations were a wonderful creation. Thank you! Yes, I look forward to soup season every year and in that regard I feel lucky I live somewhere it’s cool much of the year 🙂 I also love pairing apple cider with smoky flavors like chili powder. This looks like a beautiful rendition of chili. I’m obsessed with chili! I can’t wait for this time of year. I’m absolutely saving this recipe to make soon. I just did several soups this weekend that I could freeze up and have ready at a moments notice. Not going to lie, two of those included butternut squash! So good! Oooh, yum. Do the butternut squash pieces fall apart when re-heating? Not that it would taste any different. 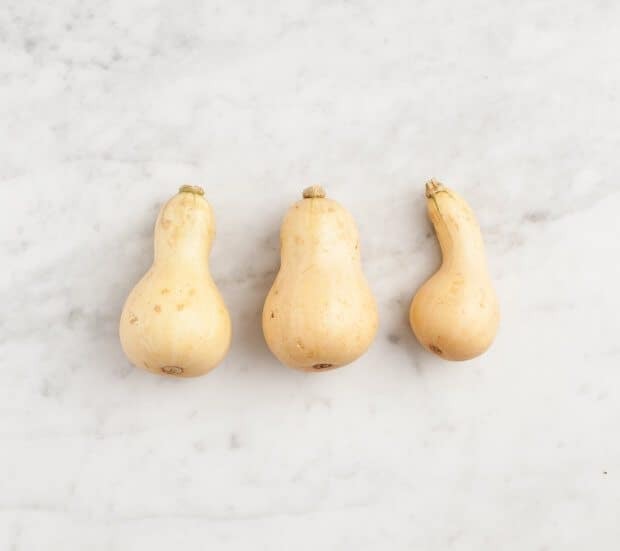 Hi Kelley – they get softer over time but in a very delicious way – butternut squash tends to hold it’s shape (more than sweet potatoes, which I sometimes use here). I’m loving this dish! Butternut pumpkin is my favourite of all pumpkins 🙂 I love it’s deliciously nutty sweetness – which I think will work perfectly with your list of ingredients here. I love the colours of this soup, it looks so happy. I will definitely try this one, maybe leave out the cillantro as I am not a big fan. This looks like the ultimate fall chili! Can’t wait to try it. Soup season is my favorite. 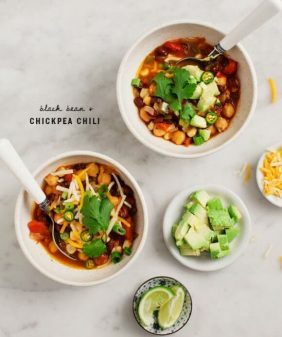 I’m always on the lookout for good vegetarian chili recipes, and this looks phenomenal- I can’t wait to try it out. Do you think this would work in the crockpot? I was thinking of sauteing the onions and garlic first then adding those and all other ingredients to crockpot. How long would you cook it? Hi Jessie, I’m not sure because I’ve never used a crockpot – but I don’t see why it wouldn’t (if you sauté the onions and garlic first, like you say). I’m not sure how long, maybe someone else reading this thread will have some crockpot advice! Ahhh this looks so yummy! We are headed back up to 90 this weekend in Los Angeles so it’s not soup season yet. 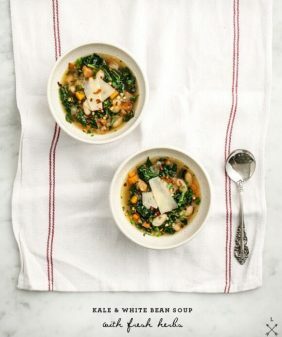 I’m hoping we’re only a couple of weeks away because soup season is my favorite. Can’t wait to try this one! Looks delicious! Should there be a note about the broth? In the ingredient list there are double asterisk ** but no note underneath. Just wondering! How cute are they? Super Cute!! Haha. My grandfather had soup every.single.day – 365 days a year…NO EXCEPTIONS. So I don’t know from soup season…in my house everyday is soup season. 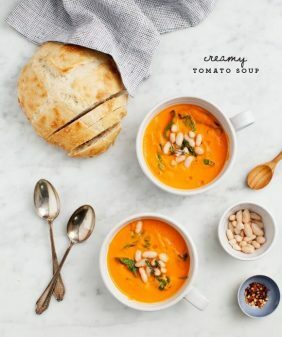 I don’t know how you accomplished creating a soup that looks both warming and refreshing at the same time…so great! I am having this for dinner right now and I am in love! I’ve been looking for a good vegetarian chili recipe and this one looks amazing. Love the cashew cream too! Can you freeze this soup? How does it hold up? Thanks! I just made a batch and it is delicious!!!! Thanks! Your photos are absolutely beautiful! And this recipe! YUM! Pinning and making this this weekend for sure! It’s restaurant festival in London right now too but we don’t have the variety of restaurants like those in Austin. Visiting Austin is definitely on my bucket list. Will keep this as a reference. I just made this for dinner and it is AMAZING!!! The lime juice at the end really does the trick! So good! We made this for dinner tonight – yum! The most light, fresh, delicious chili I’ve ever had, and super easy to boot. A perfect summer-to-fall recipe. Will definitely make this again and again. Thanks for the killer recipe! I’m making this now and just waiting for the carrots to cook a tad bit longer. Does yours have quite a bit of liquid left in it? I was expecting the broth to burn down some, but it really hasn’t. We eyeballed the broth, so I can’t be of much help there. Sorry! I made this soup today. Wow, wow, wow! Easy and amazing. It is delicious. Thank you for posting such a great recipe. Can’t wait to have it for dinner again tomorrow night! I’m SO glad, thanks for coming back to let me know!! This soup was amazing! A new favorite! Love hearing that – thanks! Lovely looking chili and tableware! Can I ask where you got the bowls from? I made this for dinner this evening. OMG is it delicious! I made it more chili-like by adding some quinoa to thicken it a bit. I love the cashew sauce on top. Once again, thank you Jeanine! I absolutely loved making this recipe – all elements work so well together, healthy and nutritious, as always on L&L. As partner can’t have nuts, except almonds (don’t ask me why?) used sunflower seeds for base to cashew nut cream. As with cashews, it tasted beautiful, rich and silky. The lime takes it to another level. Have dropped so many unsubtle ‘hints’ for your new book for Christmas Janine. Thank you for creating and sharing such inspiring ideas – healthy food that I enjoy making – that my family actually wants to eat! Made this for a crowd yesterday to satisfy the vegan (me) along with salmon and pot roast for the ones I have not yet converted.The chili was excellent and enjoyed by all, but it was the cashew cream that was the hit of the night. It was used by everyone on every type of food! So glad I took the time to make this, and will be making it again and again. Thank you for another great recipe! thanks Laura! So glad you enjoyed! Thanks for the recipes, Amy! Now mealtime will be much more fun. Gorgeous and delicious – next time I will double the recipe and make the crema. I definitely recommend this recipe. Thanks for this great vegan recipe! I used it for a chili-themed potluck at work and vegans and meat-eaters alike all loved it. It was a bit spicy for some though. I personally like to add a bit more lime juice than is called for because I love the zip it brings to the flavor. Hi Nikki, I’m so glad you liked it! Thank you for your feedback about the spice and the lime, I’ll add a few extra notes to the recipe. Made exactly as per your recipe minus the optional stuff, all scratch ingredients, except using a small whole diced tomato instead of cherry tomatoes. Very nice, it didn’t need the optional garnishes. I mixed in about 1/3 volume of cooked long grain white rice for my second serving. That is filling. The Poblano pepper in Washington State is mild. Maybe some Louisiana hot sauce next time? Probably could use a teaspoon of salt instead of the half I used. Thanks. I’m almost totally vegan now, and this helps. I have a handful of websites I hit up when I am looking for a new recipe. Yours never disappoints! This was delicious and easy. 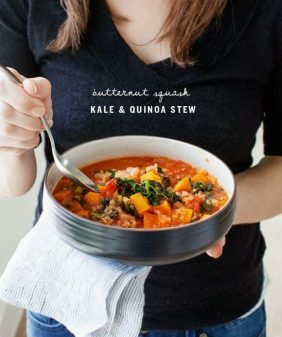 Love a recipe that features squash in a savory/spicy way!